The unique genetic package Gelbvieh brings to the beef industry is no accident. This German breed has a centuries old history of explosive growth, high fertility and superior milking ability compared to other breeds. The rigid production standards of the German government made sure only the best Gelbvieh fullblood genetics were imported to the United States in 1971. The American Gelbvieh Association (AGA) built on this rich history of performance records and provides the most reliable information possible to its members and commercial cattle producers. Multi-Breed Evaluation (MBE) provides the most accurate EPD values in the industry. Black or red, purebred or fullblood, Gelbvieh provides the genetics for extra pounds and high maternal replacement females. Today's Gelbvieh are mostly polled; a recent look at AGA data shows more than 90 percent registered are polled. 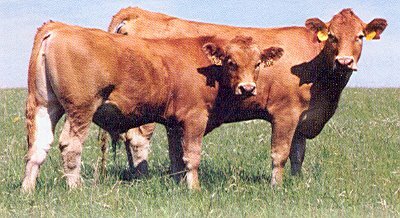 Meat Animal Research Center, Clay Center, Nebraska, data shows that Gelbvieh is the only breed to have reduced mature cow size from Cycle II, in the early 1970s, to Cycle VII, the most recent study. Smaller mature size makes for a more efficient cow. Gelbvieh females excel at milk production and will wean off a heavy calf even with a smaller mature cow size. Gelbvieh also continues to reduce its birth weights with each generation, while optimizing growth and mature size. The Gelbvieh birth weight trend shows the improvement made in the breed. Meat Animal Research data shows a 4 percent increase in calving ease for Gelbvieh, significantly more than any of the other continental breeds represented in the germplasm study.